Barely noticeable heating modules in the lower back section. 4 ways to wear. 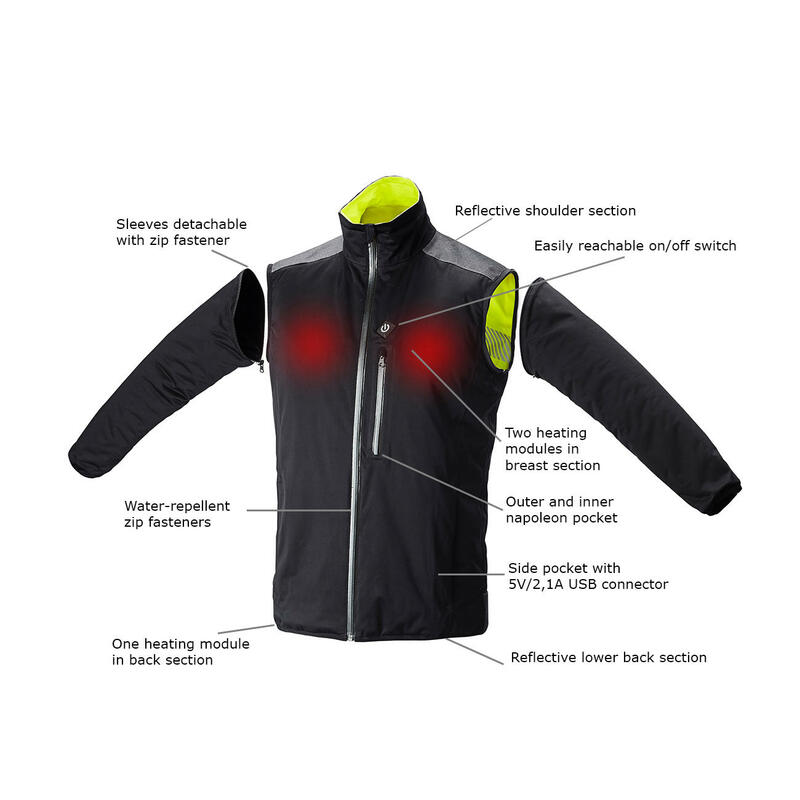 And even heated: Multifunctional jacket with Swiss know-how. So many merits in one garment is highly unusual: The shell of this smart-sporty functional jacket is breathable, windproof and highly water-repellent. On cold days, the jacket can be heated. It makes the wearer highly visible in the dark. 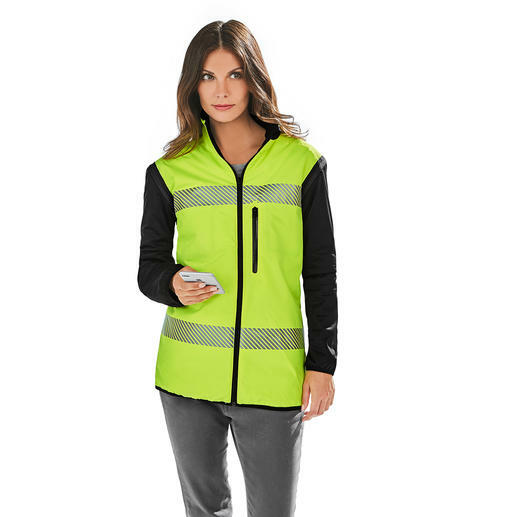 By zipping off the sleeves, it can be transformed into a safety vest with warning function in an instant. At the same time, it is pleasantly light, flexible and crease-resistant. Perfect to have at hand at any time! The innovative upper fabric prevents moisture from penetrating, yet it allows water vapour to escape. 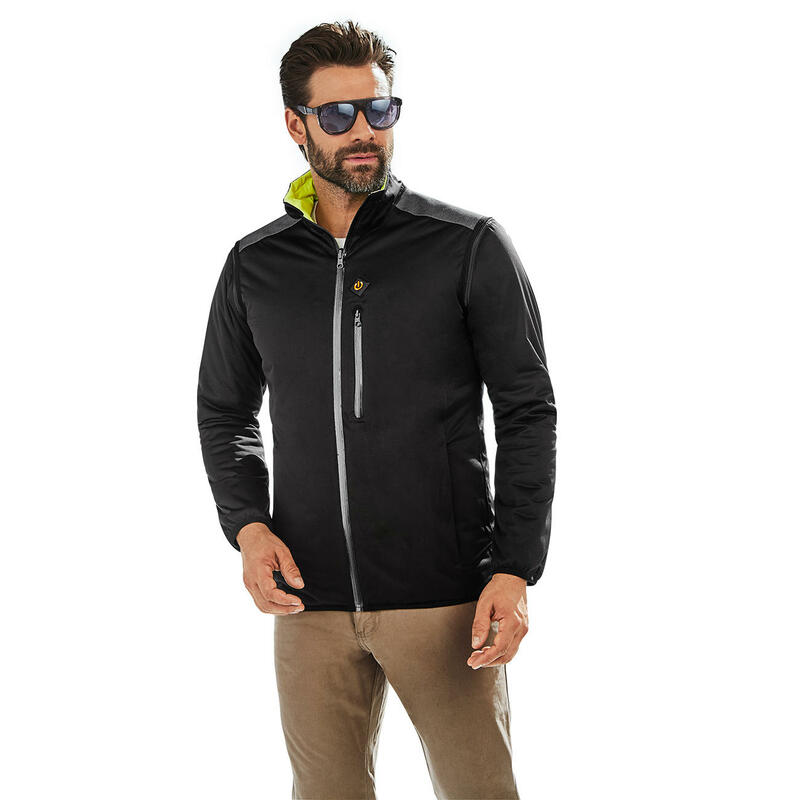 High breathability guarantees superb wearing comfort. The special fabric inserts on the dark upper side reflect incidental light at dusk and in the dark. The fluorescent yellow inner material is breathable and non-fading, thanks to an innovative dyeing technology. 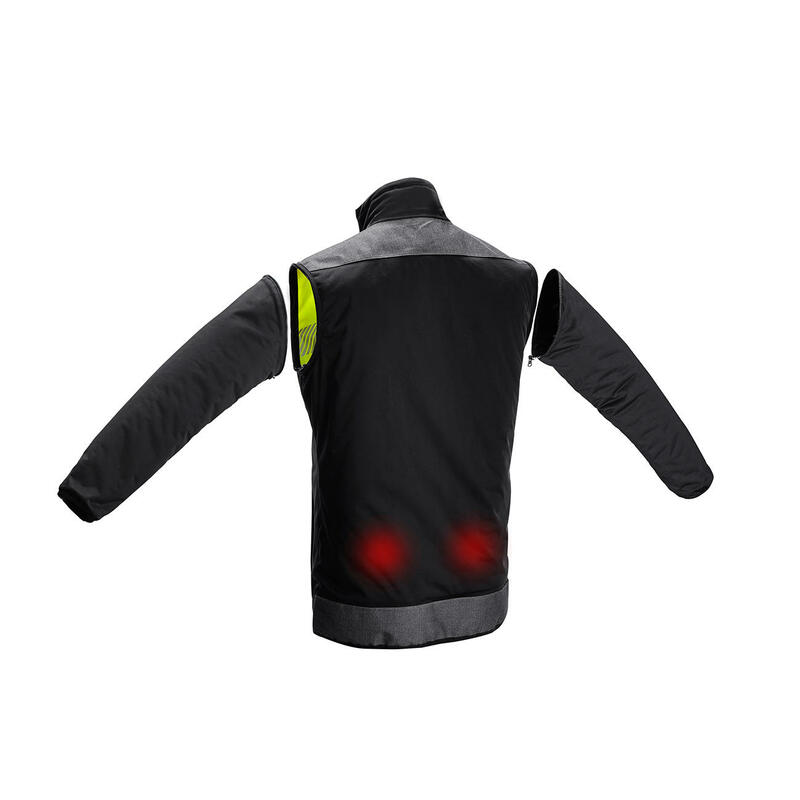 Together with retroreflective stripes, it can be detected even from afar. At the push of a button, you can activate the 4-step heating system, which operates using a conventional power bank (recommended battery size: 10,000 mAh). The system can operate for up to 6 hours and the power bank can be stowed comfortably in the left outer pocket. You can simply charge your mobile devices with the power bank if no heating is needed. Colour: Black/yellow. Shell and inside made of 100% polyester. Length in size 40: 74cm (29.1“). Weighs 750g (26.5 oz). Machine washable. Notable characteristics are the typically yellow fluorescent colour and the retroreflective stripes. Also known as a high-visibility vest, it makes people in traffic or during recreational activities for example, highly visible even from a distance and in difficult light conditions.